There's a reason I used coconuts not once but twice in my Beauty Foods series (link to my post on coconut oil) - they are basically the holy grail of plant foods! Plus they are so versatile and delicious. When I decided to focus on hydration, coconut water was the first thing that came to mind. Not only is it a liquid, but it is full properties that help hydrate our bodies from the inside-out. Hydrating foods will be the topic for the next three days! Growing up in (the very non-tropical) state of Oregon in the 80s and 90s, I can't say coconut was a big part of my life. In fact, I thought I didn't like coconut since my mom disliked the fakey taste of Almond Joy candy bars so much that they were pretty much outlawed from our house. My mom being the health nut that she was didn't like fake anything (which I'm so grateful for now! ), and that was her/my only association with coconut. But fast-forward to the influx of widespread, natural, minimally-processed foods that we've been enjoying more of in recent years...and I can't get enough of the real-deal coconut. And lucky for us, even in non-tropical areas, we can enjoy quality coconut products year-round. You may be thinking, this seems like a silly question - of course we all know what a coconut is! It's a tropical, fuzzy, hard-shelled sphere that hangs off palm trees. It has a fibrous, woody outside, a white 'meat' lining inside, and a thin watery substance filling the middle. But, have you considered, you may not know one very basic thing about a coconut? And that is - what kind of food is it? A nut? A fruit? A seed? I only recently found out! So if you know the answer, you're way ahead of me! The answer is that coconuts are (kind of) all three! I'll explain. Technically coconuts are what's known as a drupe - a category of fruits with a hard, stony covering enclosing a seed. A nut is a type of fruit made up of a shell and a seed. However, a true nut (like walnuts and hazelnuts) don't split open when ripe to release their seeds. Seeds are released when the fruit wall eventually decays or is digested by an animal. A coconut, on the other hand, does split open. Others in the drupe family include; mangoes, olives, apricots, and peaches. In coconut's case, we eat/drink the seed inside the pit instead of eating the fruit (like we do in other well-known drupes). 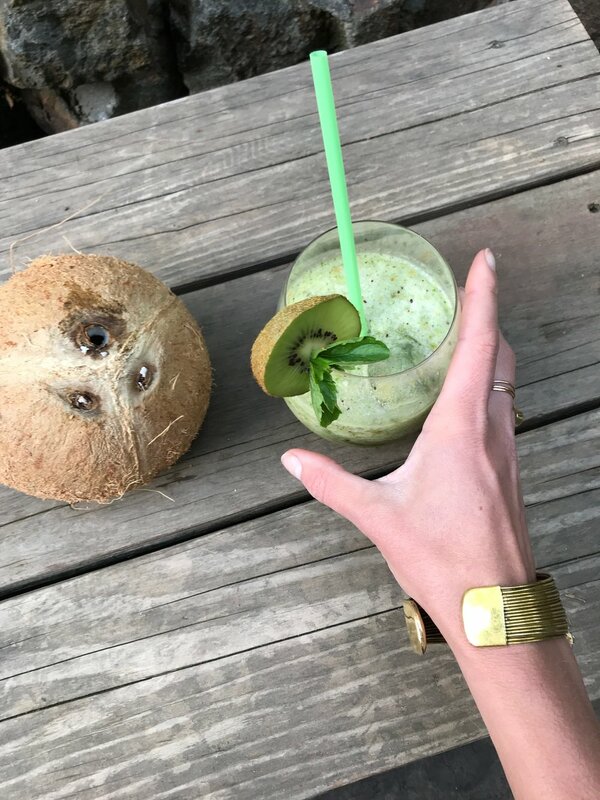 Why is the juice that hails from a coconut so amazing for our body (and skin)? Let's start with hydration. Coconuts naturally contain electrolytes - think of electrolytes as electricity for our cells. When our cells are electrified, or turned on, they are able to talk to each other more clearly. When your skin (and cells) are hydrated optimally, your skin will appear its most vibrant, youthful self. Hydration also plays a role in your skin's collagen, which helps to restore elasticity, flexibility, and combat signs of aging like wrinkles and under-eye circles. This special property of coconut water also means that your body is better able to absorb nutrients from everything you're consuming. Coconut water also contains high levels of key beauty-boosting nutrients, like lauric acid, iron, potassium (a critical mineral salt), magnesium (the calming mineral), and calcium. - infertility as they replenish the reproductive organs with their trace minerals and electrolytes. - hypoglycemia and other blood sugar disorders, like diabetes, as they rebalance and regulate the blood sugar. - dehydration - coconut water replenishes all the essential minerals and salts we need in times of dehydration. It can be used as a natural alternative to products like Pedialyte and Gatorade. - adrenal imbalance (over or underachieve adrenals) being that coconuts are cooling, calming, hydrating, and rich in calcium and magnesium, they are the perfect calming adrenal supporters and help bring us back into balance. - insomnia and sleep apnea - if we don't have the neurotransmitter chemicals we need, we can have trouble sleeping. Coconut water provides the extra mineral salts and electrolytes that support our neurotransmitters. Let's get to the recipe of the day! 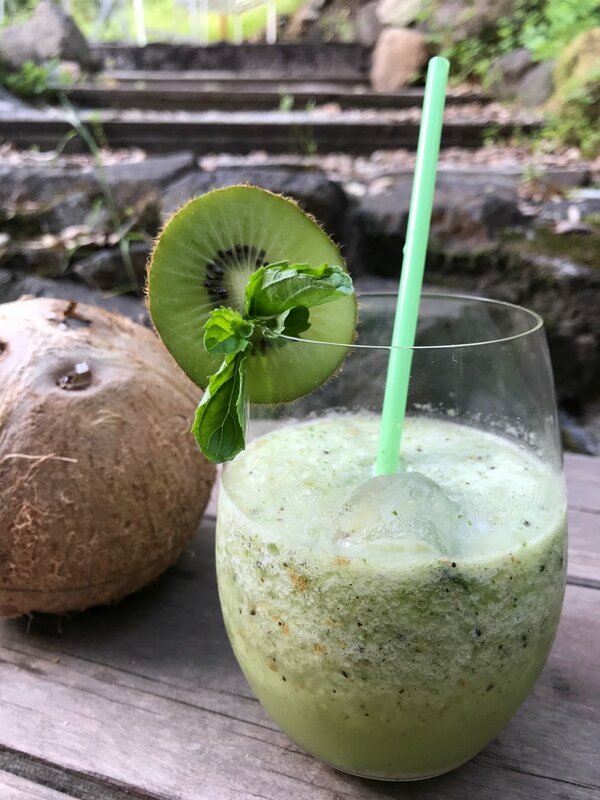 I've designed this recipe to be super hydrating and therefore picked some other ingredients that are not only delicious, but wonderful skin and body hydrators as well. Kiwi is a wonderful low-sugar, flavorful fruit. They are great for regulating blood sugar and diabetes. Kiwi is rich in trace minerals and vitamin C. The phenolic acid in kiwi seeds help remove radiation from the body and inhibits viruses. Limes have similar nutrition benefits to lemons. They are a rich source of vitamin C, which makes them amazing liver (and skin!) detoxers. Alkalinizing limes also contain calcium and the phytochemical limonoid that bond the vitamin C and calcium, making them more bioavailable for our cells! Kiwi skin is completely edible. By leaving it on, you triple the fiber intake compared to a peeled kiwi. The skin is also loaded with vitamin C. So give your kiwi a good wash and simply cut out the nubby ends. And voila - faster and healthier! Side note: you'll be freezing the ice cube tray so make sure to plan ahead. 1. Grab you're empty ice cube tray. 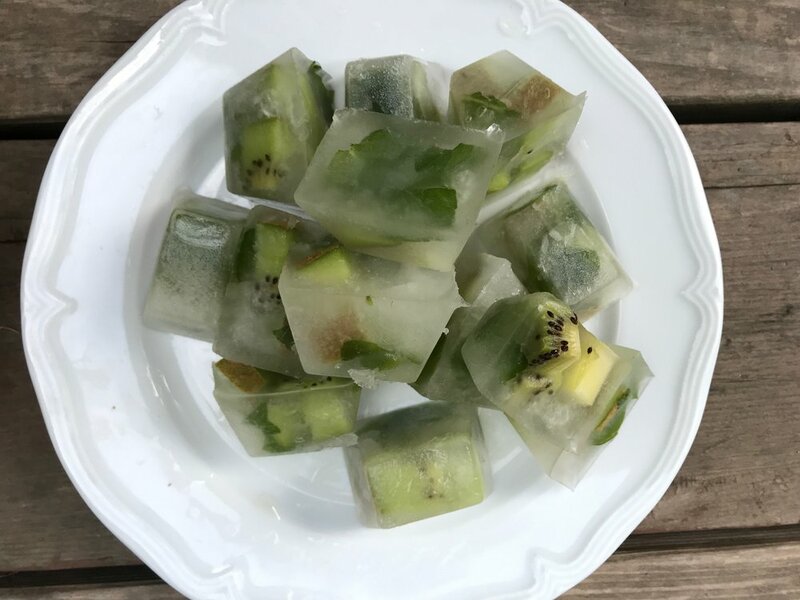 Divide kiwi pieces into ice cube holes. Do the same with the juice of one lime and mint. It doesn't have to be perfect as it will all be blended together. 2. Place tray in freezer and allow to freeze for a few hours. This can be done ahead of time if you want your mo(ck)jito when you get home from work! 3. Remove tray from freezer and place all the ice cubes into your blender. Add ~2 cups of coconut water. Blend well. 4. Squeeze the juice of 1/2 lime into each, dropping the lime peel in for additional garnish if desired. Pour blended mixture into glasses. Thank you for joining me for today's inside out beauty food of the day!